If you’ve stopped here expecting to read a first-hand account about my trailing the Mother of all Whitetails with trusty bow and arrow in hand, or how I crafted a prize-winning primitive bow from a gnarled and twisted piece of worm-holed driftwood, you’ve turned to the wrong page. Yes, this is a yarn about me on a trail, of sorts, with bow and arrow, all right. And it will detail the making of a fine, handcrafted bow by a true master bowyer. Only the trail is one of discovery, and that little ol’ bowmaker isn’t me. Maybe I should explain. I’m new to this primitive archery thing. I’m so new, I still get my bow back confused with its belly, and I have a tough time keeping my deflex, reflex, deflex-reflex business straight. Draw length and draw weight? Forget it. And what the heck does center-fire mean, anyway? At my age, it’s all just a bit too much minutia to stuff in my head for more than a few minutes, but it is coming, even if slowly. I am learning thanks to my good friend, Dave Green, and new friend and mentor, Itazipa Hanska, or Richard Longbow, in Maine. And that’s really what this story is about – about how it’s never too late to teach an old dog some new tricks, and how the thrill of discovering something new is no less exciting for someone on the cusp of 58, than it is for an 8-year- old youngster. In fact, I’ve come to learn that there are no age or gender limits on primitive archery. Longbow recently told me about an 80-year-old woman who still enjoys flinging a few arrows around. There’s a bow out there suited to most anyone’s strength and ability. I guess I’ve always been interested in primitive archery, I just didn’t know it until a few months ago. I grew up when downtown movie theaters and Saturday morning television were filled with old western shoot-’em-ups. Of course, back then cowboys were always the “good guys” and Indians were, well, Indians. But I’ve always been partial to underdogs, and in my own childhood games, I usually chose to be the Indian. So it was little surprise that every December, I always asked for “a real (emphasis on “real”) bow and arrow” set from Santa. And every Christmas morning I would wake to find yet another toy bow and arrow set under the tree. Y’know, the ones with the little suction cups on the arrow tips. In retrospect, giving me a “real” bow with steel-tipped arrows would have been nuts, even if I thought it was a good idea at the time. At some point, I stopped asking, discovered cars, guitars, and girls, and got on with my life without archery. I’ve known Dave Green since 1973, when we both landed at the former Bucks Harbor Air Force Station in Maine. I was a radar operator and he was a radar maintenance tech. But we both shared an interest in making music together. It is something we still do, more than three decades later, with The Rockin’ Road Dogs. Dave has always loved the outdoors, and enjoys hunting, fishing, and canoeing. His hunting interests have evolved from strictly firearms, to eventually include muzzle loading, and, later, archery with a compound bow. That was, until he discovered primitive archery. On one of my visits some years ago, Dave proudly showed off his growing collection of those other-worldly-looking compound contraptions. I have to admit those gizmos failed to spark any interest in me at all. You might as well have been talking to me about the price of avocados in Colima, Mexico. To me, those monstrosities with all their pulleys, sights, stabilizers, and what-alls, just didn’t look like “real” bows at all. Nope, that wasn’t for me. Then, a couple of years ago, Dave started telling me about someone named Longbow, whom he met at the annual Machias Blueberry Festival one August. This meeting not only changed Dave’s perspective on archery, but eventually led me to the primitive fold, too. Longbow, who is of Lakota descent, is a three-dimensional Native American artist who crafts some exceptional items, from ceremonial and recreational pipes, to clothing, knives, jewelry, you name it. But true to his Lakota name, Itazipa Hanska, Longbow is a maker of the longbow. Dave had showed me some of Longbow’s impressive work. He owns no less than three of Longbow’s hand-crafted bows, and Dave’s wife owns a fourth. Dave took down his first primitive-bow-shot deer with one of these bows during the fall 2005 hunting season. Then this past August, Dave suggested I swing by his place the next day and “throw a few arrows.” The notion of “throwing” an arrow, rather than using a bow to launch it, sounded a bit odd to me, but I figured what the heck. I could do no more than make a total fool out of myself, which is something I’ve been doing most of my life anyway. So, at about 10 a.m. the next morning, I pulled up to Dave’s home. He had a target set up and had a bunch of primitive bows, with full quivers, at the ready. I said a prayer to the god of lost arrows to not take any of mine – well, Dave’s – on this day. Thankfully my prayer was answered, although my first shot was destined for the ocean had it not caught the very upper lip of the target backstop on its upward flight. Mind you, I hadn’t shot a bow since I was barely out of diapers. As kids we used to break off a thick tree branch, tie a string to each end and try to shoot the skinnier tree branches as arrows. Oh, and I did shoot those toy bow and arrow sets I got every Christmas, at least until the darn things broke. But that was a half-century ago. So, I figured if I could hit anything smaller than a barn door, it would be an accomplishment. I did a bit better. “Put your fingers like this,” Dave coached, showing me how to “nock” an arrow and grip the string. I had my hands full with his 70-pound buffalo-backed bow. I’m no Charlie Atlas, so that one was a bit tough for me to draw. We tried a few others, and I settled on one of Longbow’s off-hand bows. Amazingly, I actually hit a small blue circle from some distance, and none of the arrows went soaring to the nether-reaches of Dave’s back field. More importantly, it was all wicked good fun, to borrow from the downeast Maine vernacular. This was something I really could do, after all. Two months later, I was back, and this time Longbow joined us. He had been away all summer doing primitive archery demonstrations at various fairs and gatherings in the Midwest. Now he was back in Maine to work on projects for the coming year and he was going to join Dave and me for some backyard shooting. 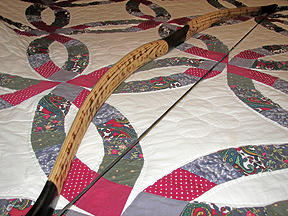 Longbow brought over several of his fine bows and had me try various ones. Eventually I latched on to his button-back bow as the one I could handle best and shoot with consistency. “Let me watch you,” Longbow said, after we’d all been shooting, I mean “throwing” arrows for a while. He adjusted my stance and repositioned my arms slightly. Then, he picked up on something that was causing the bowstring to clip my arm and slowing my shots down. I pulled back on the bowstring and let an arrow fly. 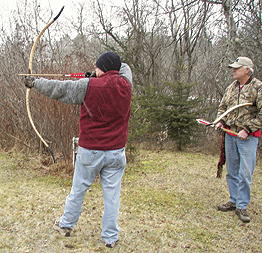 A month later, I had a chance to return to Maine and shoot one-on-one with Longbow. “Let’s do a walk-back,” he said, dropping two arrows close to the target, then two more slightly further back, and the last two even further. “The idea is to adjust how you shoot at the target, and to get a feel for your bow,” he said. He explained that I should sight down the arrow towards the target and let the arrow fly, for the closest shots. Draw and snap. The middle two shots involved half-sighting, with half-instinctive shooting at the target. The furthest shots were made by pure instinct, looking at the target without actually sighting it in. I recalled Dave saying once, “It’s like throwing a baseball. You don’t aim the ball, you just throw it. It’s the same with shooting an arrow – you look at the target and ‘throw’ the arrow.” All of the arrows somehow found their marks. If I wasn’t hooked before, I definitely had the fever now, and before I left, I sat down with Longbow and ordered a new bow. He took some measurements, jotted down some notes, and offered some suggestions concerning draw weight (okay, I’ve learned that one) based on his observations of my own shooting. 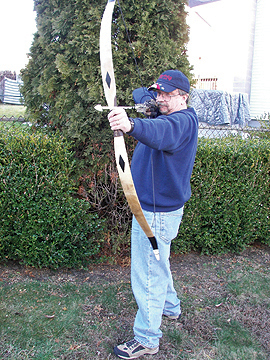 At 60 inches in overall length, this bow would be a little shorter than a true longbow. It would be made from a single white ash stave, buffalo backed, with a 55-pound draw weight, and a 24-inch draw length. The brace height would end up at 6 1/4 inches. I also ordered 10 target arrows and two primitive hunting arrows. Even though I’m not a hunter, Longbow’s arrows are incredible works of art in and of themselves. It’s not that I oppose hunting. But I can’t see shooting a critter I probably wouldn’t eat or use for something. I like a little deer meat, but most of the animal would go to waste. So, I choose to leave the hunting to folks like Dave who will use and enjoy the entire animal, so that its sacrifice won’t be wasted. Longbow has been making bows “for many, many winters,” he explained. 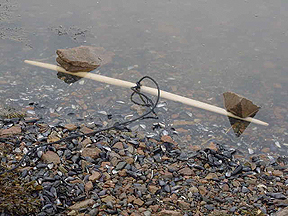 “In Japan, I’m considered a master bow maker.” He told me about several unique and innovative techniques he has developed and perfected over the years, such as saltwater curing (see the feature Longbow wrote on the subject in the December/January 2007 PA). 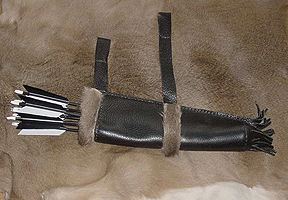 He also backs some bows with buffalo hide, which is an especially thick and tough hide to work with. His bows are not flat but crowned slightly, which he believes increases their strength and durability. “Each bow I make is ‘my’ bow,” he said, with pride. “I make each one like I’m making it for myself. If I’m not happy with something, I won’t let it go. Over the course of seven weeks, Longbow called me several times each week, keeping me abreast on the bow’s progress. He told me about its saltwater soakings, its shaping, and its tillering. 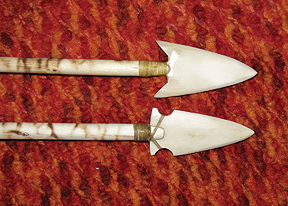 I knew when the buffalo backing was cut, when the recurve was started, when the buffalo horn and bone tips were made. Every so often, Longbow zapped me some pictures by email from the public library in Milbridge, Maine. I was 330 miles away in Nashua, New Hampshire, but he guided me along every step in the process, so that I felt I was there with him from start to finish. Even though he has made countless bows over his “many winters,” Longbow was as excited and enthusiastic about this bow as if it were his first. “Hi, Paul,” one of his calls began. “I had an idea but I wanted to ask you first. I was thinking about fire-burning the belly. What do you think?” I was ecstatic. I had seen the fire-burned bow he made for Dave’s wife, Janet, and it was truly special. I thought about asking him to do that on mine, but chose to let the spirit guide his hands and heart in making my bow. Apparently the spirit led him down the same path. Longbow also decided to make this a “whirlwind” bow. I wear a medicine bag that he gifted me with earlier in the year, and it has a small diamond-shaped piece of buffalo bone attached to it. Four of these shapes together make up the whirlwind. 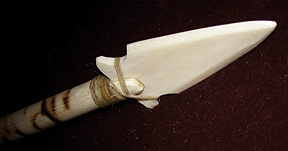 “The whirlwind is an important symbol to the indigenous people,” Longbow explained. “It symbolizes the four directions.” He eventually painted this symbol along the buffalo hide backing on the bow using earth-tone paints mixed from natural materials from his native South Dakota. I have learned that in the Lakota culture, a bow is more than just a stick and string. 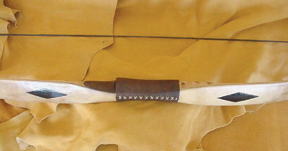 Back in the days of the grand tribal buffalo hunts, a Lakota’s bow was a sacred object, as were his arrows. If treated with respect, they would help provide the buffalo and other game needed to feed and clothe his family. Prayers were offered to the bow and arrows before a hunt and in thanksgiving after the hunt for the food it delivered. There is a delicate balance to all things in nature, and this balance is reflected in the way Longbow creates his bows. Each is made from a single stave of wood, without additional laminates. He has learned to read the growth rings and how to tiller the limbs for perfect balance. A good bow reflects harmony and balance in its strength, grace and power. Thanks to my friend Dave, I have been introduced to the world of primitive archery and I’m having a blast. More importantly, I have come to know Richard Longbow – Itazipa Hanska – and feel blessed to be touched by the spirit and power of his bows. I’m guessing that just about everybody works with, or otherwise knows, somebody who would be willing to give this archery gig a try, if only they were asked. What’s the worst thing they could say? “No”? Well, at least you tried. But you might just rekindle some long-dormant interest in someone who is more than willing to give it a go if they have someone to guide them and teach them. For this slightly older dog, it just feels good to get outdoors and do something challenging and fun. What better way to get some fresh air and hone your hand-eye coordination skills? There is more than a little subconscious headwork involved with making a shot, and all of that can only help to keep an older guy’s mind active and a shade sharper. And trust me, I need all the help I can get.